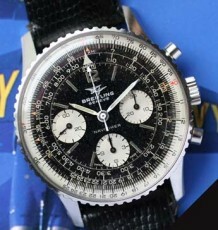 The Breitling Chronomat has been an integral part of the history of Breitling since the 1940’s. Original designed with a slide rule calculator, the Chronomat evolved into more of a casual sports watch with the pedigree of a an aviation Chronograph. 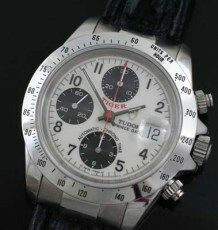 This particular model dates to the mid 1990’s and features a steel and gold bezel with gold pushers and crown. The white dial also features gold hands and accents. 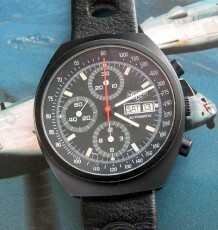 The watch is powered by the venerable Valjoux 7750 3 register movement, signed Breitling. The watch was just serviced by my watchmaker and is working flawlessly. 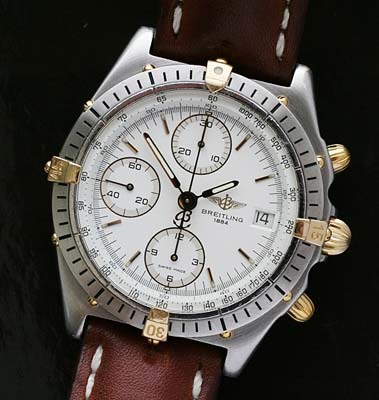 The watch measures 41 mm wide and is supplied on a genuine Breitling leather strap with Breitling buckle. 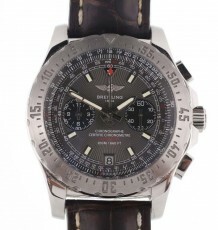 Given the short production of this model it is sought after by Breitling collectors.